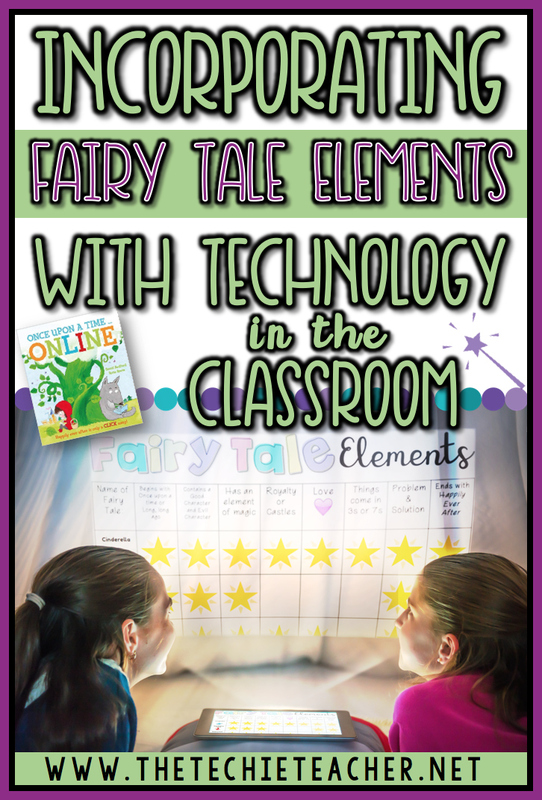 Incorporating Fairy Tale Elements with Technology in the Classroom | The Techie Teacher® . I am teaming up with my friends from The Reading Crew for our SPRING mentor text link-up and GIVEAWAY. Be sure to stop by each post to grab some ideas for your classroom as well as a secret word that you can enter into the Rafflecopter at the end of this post. You will be entered to win a copy of ALL the books that are a part of this link-up! 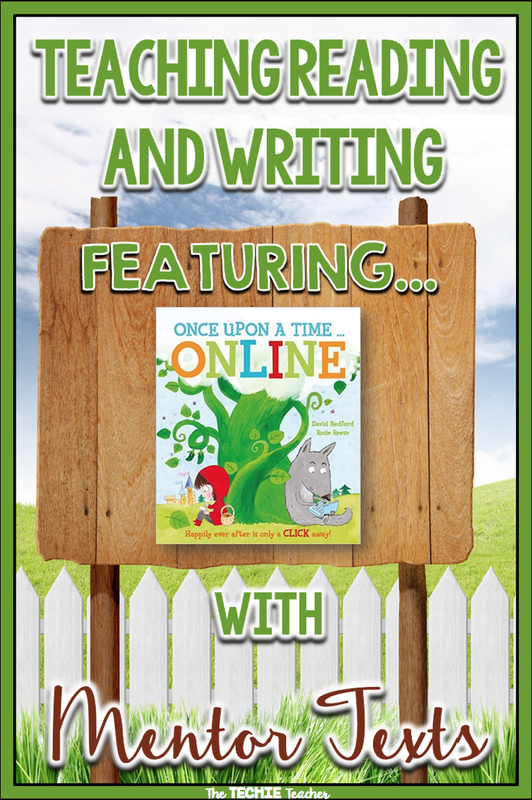 Recently I discovered this ADORABLE book called Once Upon a Time Online. If you follow my blog you will know how much I LOVE to incorporate read aloud books into my technology lessons. Check out my Top 10 List of Technology Themed Read Aloud Books. Once Upon a Time Online needs to be added to this list! 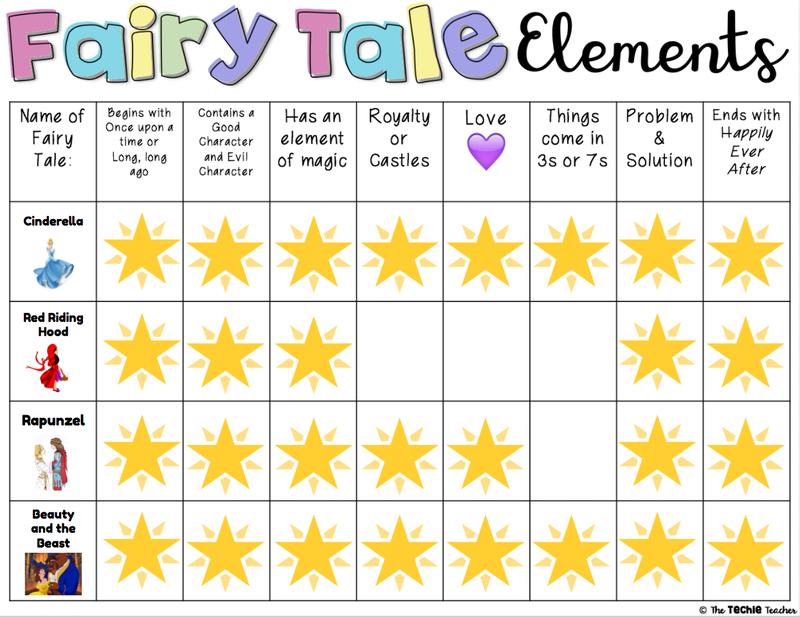 Use this book as a part of your fairy tale unit when you cover Fairy Tale Elements. I think it would be best to use this mentor text to WRAP-UP a fairy tale unit so students are familiar with the characters involved and their different personalities. Discussing and discovering fairy tale elements is an effective comprehension strategy for these stories. Fairy tales are unlike any other genre due to their magical elements and characteristics. Therefore, teaching our students about these elements will help make certain parts of the text predictable (Once upon a time...Lived happily ever after...), characters memorable (The THREE Little Pigs...The SEVEN Dwarfs) and assist with retelling. 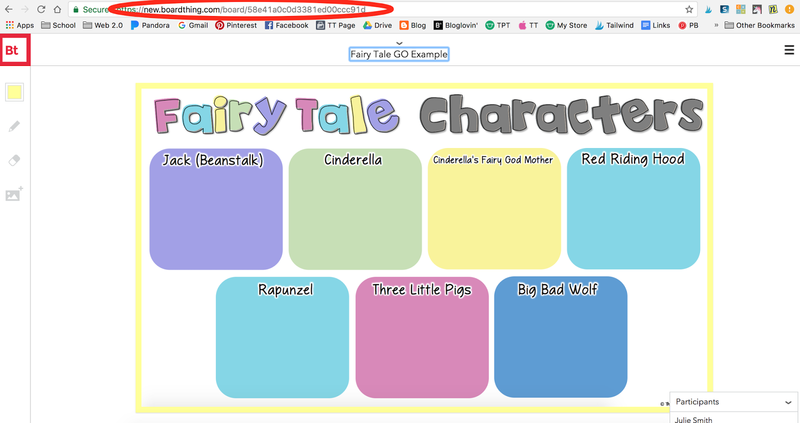 Many students may already be familiar with the titles associated with the characters in Once Upon a Time Online. However, if you have a class where you think your students may not have been exposed to fairy tales before, then read the other fairy tales FIRST. I always like to read original fairy tale stories to my students regardless if they are familiar or not so we can enjoy the oral tradition together and discuss the valuable lessons that are presented. Here is how you can carry out this warm-up activity. 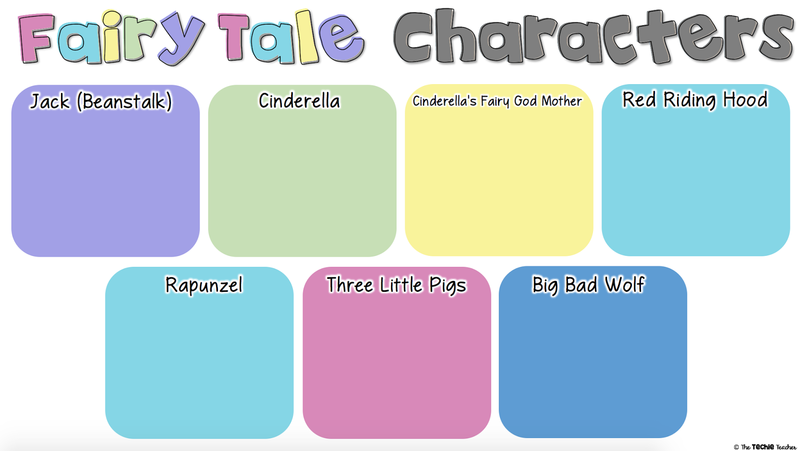 First, download this FREE Fairy Tale Characters Graphic Organizer image I created. Click the image to take you to the download. Create a FREE BoardThing account if you don't already have one. Click on New Board and give it a title. Click on the mountain icon to add the graphic organizer image. Click Select Image. Find the image, select it and then click Upload. Hover your cursor over the image until you see three dots appear in the upper right hand corner. Click and select Resize. Finally, lock down the image by hovering your cursor over it until the three dotted vertical line appears in the upper right hand corner. Click on the dots and select Lock. This will keep the image locked down so students can't move it by accident. Now you are set for your students to add their thoughts! 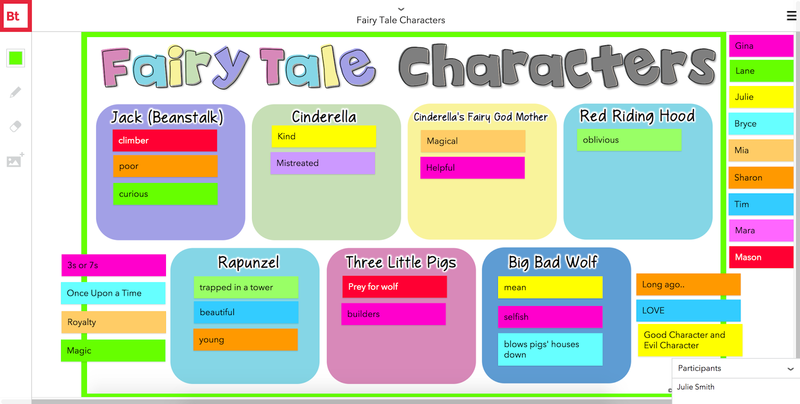 Have students list in either of the white sections of the graphic organizer the different kinds of fairy tale elements that appear in many fairy tales. Inside of the colored boxes they can add words that describe or are associated with the labeled character. Notes could contain adjectives, nouns, or anything that speaks to their character. You might consider making a couple of different boards and divide your students into small groups to complete. BoardThing will allow you to create 30 free boards. Otherwise, keep one board for everyone to work on. If you are limited on the number of devices you have available, then just project this on the board and invite students one at a time to add their ideas. BoardThing works on the Safari browser of an iPad too! To make a post-it note appear, double click on the board. Have students click in one of the white columns on either side of the image. A large post-it will appear for students to type on. They can change the color by clicking the square. Once they finish typing, they click Post. The post-it will resize to a smaller rectangle and students can place it in the correct category. They can even add images to their notes! You will see in the example below that I first had students create a post-it note with their name that is lined up on the right hand side. I highly suggest doing this if your students are going to be working collaboratively in small groups! This acts as the "key". Once all thoughts have been added, discuss each character with the class. After reading, take a picture walk-through starting at the beginning and discuss the fairy tale elements that arise. Students could complete this individually or you could complete together as a class. Check out everything that is included in this resource by clicking the image above! Once you have discussed the different fairy tale elements, decide as a class what the theme/lesson was in this story. Every fairy tale teaches some kind of lesson! In this case, students learn that they need to always be careful and conscientious when going online as well as let an adult know what they are doing. 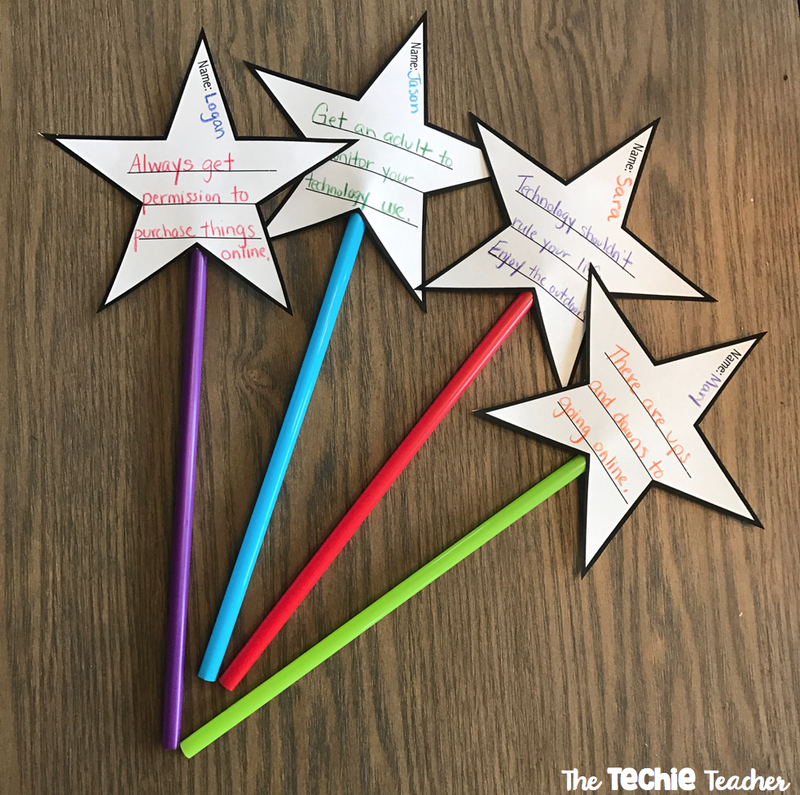 To wrap up the lesson students will create a Reflection Wand. Here are two ways this can be accomplished. Come up with your own prompt! They will cut out their star and tape a colored straw to the back of it. A "magic wand" will result. Hang them up around your room or have students take their wand home and explain to someone the important message they learned from Once Upon a Time Online. 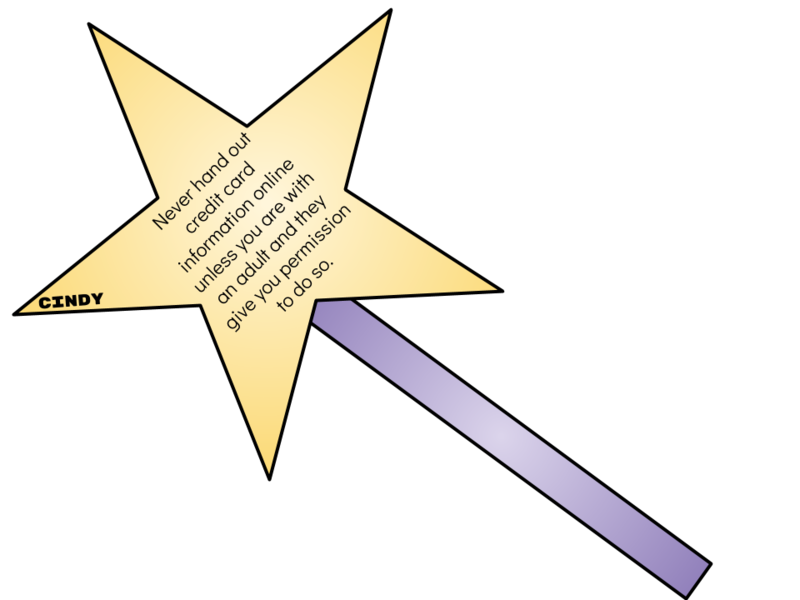 Have students use a paint or drawing program to create a wand using the rectangle shape, star shape, text box and paint can tools. 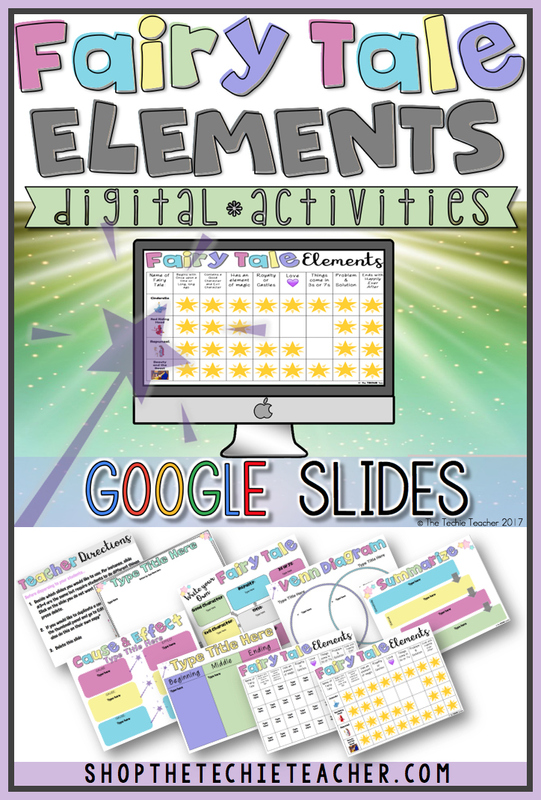 I like using Google Drawing because students can quickly and easily save their creations as pngs and upload them to other Google Apps or web tools to layer on projects and share with each other! Enter to win a copy of ALL the spring mentor texts by typing the mystery word that appears on each blog post in the Rafflecopter below. Links to the other posts will appear at the bottom of the Rafflecopter. Good luck! Julie, I always learn new applications to use in integrating technology. I've never heard of boardthing. I can wait to use it. I'm coming up with so many ideas with pbl and brainstorming. I am super pumped about your post. The ideas look like so much fun. Pinning and saving to share. Amazing! Thank you so much, Carla! You did such an incredible job (once again) organizing this for everyone. I have never used BoardThing before - I can't wait to try it out! Thank you for sharing such a user-friendly way that we can integrate technology into our ELA lessons! Let me know what you think when you try it out :) Thanks so much for stopping by! I'm going to have to check this book out, thank you! This book looks AMAZING! Thank you so much for sharing- I had never seen it before! Thanks for the great lesson, too! Awesome book to add to my fairy tale collection and never heard of boardthing - learned so much from your post. Thank you. Thank you for stopping by, Selma! I can't find the mountain picture to add onto board thing- do you have any tips? I wonder if it got removed in the new update?